Just a little teaser to let you know I've been baking again! The new recipe will be posted sometime next week - but first I have another artist from our New England trip to introduce to you. As for this little number, it makes me happy. Not only does it keep my clothes protected from my ever-wiping hands, but it has farm animals. And bonnets. And I took it from my mother's apron collection, which is mostly comprised of hand-me-downs from older generations. A collection that lives in the kitchen of the 1920's farmhouse where I grew up. So it's a little country in more ways than one and I like to think that when I wear it, I'm celebrating the little bit of country in me. 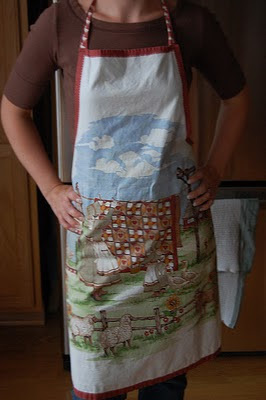 There is nothing better than hand-me-down aprons and recipes!